for ages i have been hearing great things about vegin’ out, the weekly LA vegan meal delivery service, and i can’t believe it took me until now to finally try them! 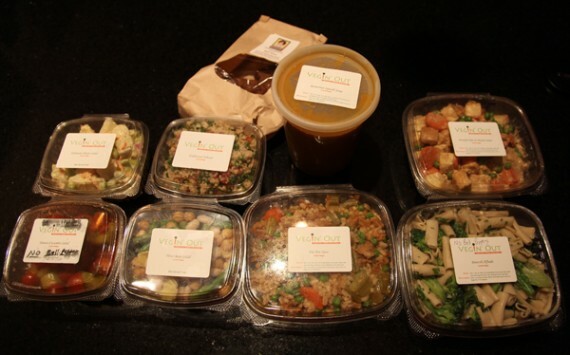 the way vegin’ out works is, you place your order by 5pm on friday evening, and then monday during the day they deliver 9-10 meals worth of food including 3 entrees, 4 side dishes, 1 soup, and 5 cookies. because so many vegans have raved about the service, i had pretty high hopes for vegin’ out…and i am happy to say my expectations were exceeded. the food was incredible, and the portions were extremely generous. this week’s menu came with the entrees broccoli alfredo, braised tofu in peanut sauce and fat tire stew accompanied by traditional tabouli, tomato cucumber salad, edamame potato salad, three bean salad, butternut squash soup and black forest cookies. every single dish was absolutely delicious, so let’s just jump right in to the food. 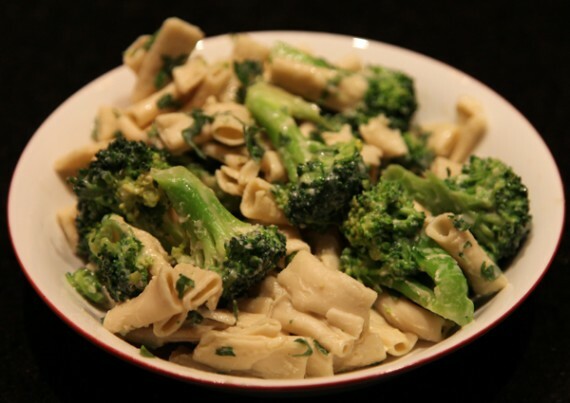 broccoli alfredo: rice pasta, broccoli, garlic, soy milk, nutritional yest, fresh parsley, earth balance margarine. our first entree was broccoli alfredo, which normally comes with bell peppers, but vegin’ out was kind enough to omit those for me. the dish came with huge chunks of quality broccoli, fat soft noodles, and a rich creamy cheese sauce that didn’t taste vegan. 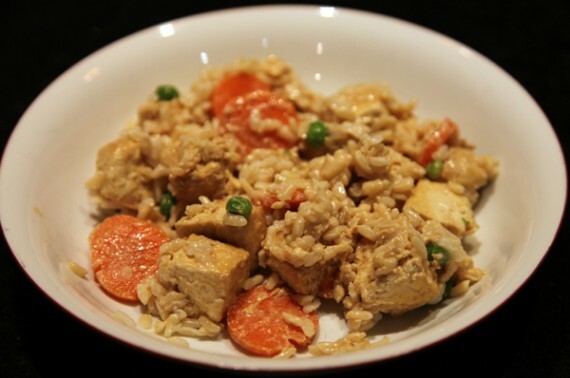 braised tofu in peanut sauce: tofu, carrots, peas, and brown rice in a peanut sauce. next up was the braised tofu in peanut sauce, another excellent entree. this came with big chunks of cubed tofu and mixed vegetables all over brown rice in a peanutty garlicky sauce. while this dish was pretty damn near perfect, on our second night of eating it for dinner we threw in some chopped fresh chilies for a bit of heat….even better! fat tire stew: homemade seitan, carrots, celery, potatoes, onions, peas, barley and garlic in a fat tire beer broth. lastly, the fat tire stew entree was by far my favorite of them all. we were hit with a bit of cold weather this week, and this warming stew was exactly what i needed. the picture really doesn’t convey how good it was, but it came with hearty ingredients like carrots and potatoes along with some of the best seitan i’ve ever tasted. i would eat this everyday if i could. 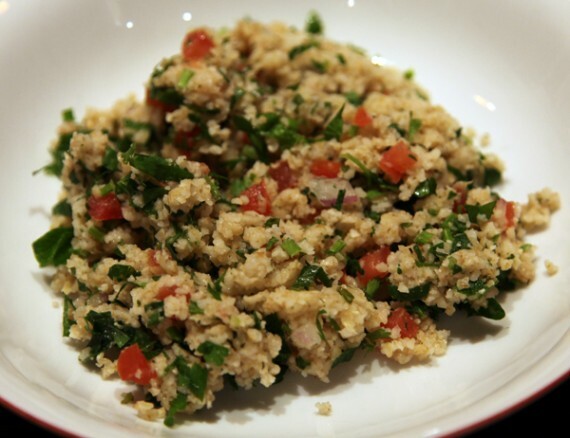 traditional tabouli: bulgur wheat, fresh tomatoes, onions, parsley, mint, garlic, olive oil, lemon juice. not to be outdone by the tasty entrees, the sides by vegin’ out were also top notch. first up we have the traditional tabouli which was all kinds of fresh and minty. this was awesome for lunches throughout the week and for light snacks. 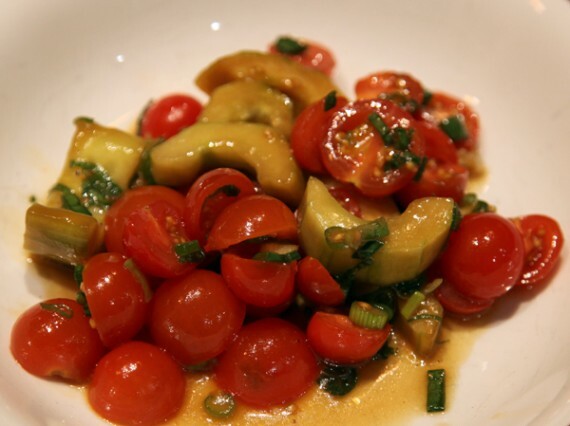 tomato and cucumber salad: cherry tomatoes, cucumbers, scallions, hoisin sauce, tamari, sesame oil. the tomato and cucumber salad is another dish that usually comes with bell peppers, but again vegin’ out was happy to customize my order. all the vegetables in this were soft and delicate, and the hoisin/tamari dressing was light and flavorful. i think this was the only side dish we ate ALL of on the first night. 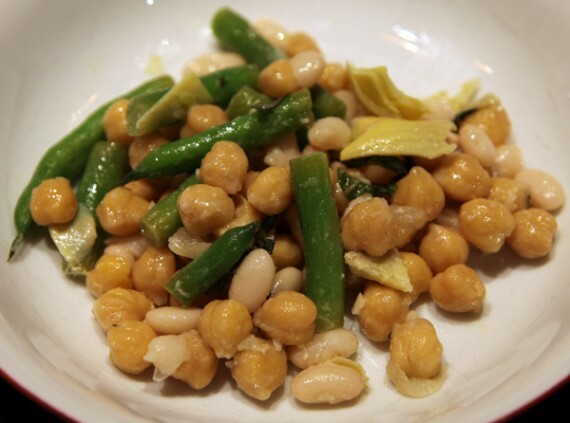 three bean salad: chickpeas, white beans, green beans, artichoke hearts, and fresh basil. the third side dish was a three bean salad that came with chickpeas, white beans and green beans with artichoke hearts in a vinegar mustard dressing. i really liked this one because it was substantial and flavorful, but not overly heavy or oily. the artichoke hearts are kind of hidden in the picture, but there were a lot of them in the dish. 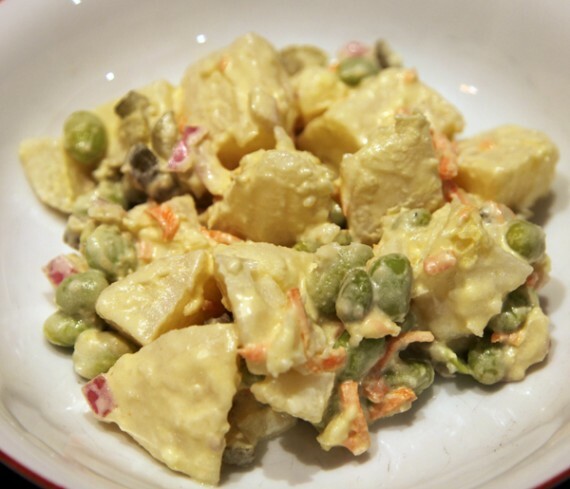 edamame potato salad: potatoes, edamame, carrots, dill pickles, vegenaise, lemmon juice, vinegar, mustard, horseradish. the last side, edamame potato salad was by far my favorite thing in the entire order. i’ve never had edamame in a potato salad before, but DUDE it is a great combo! 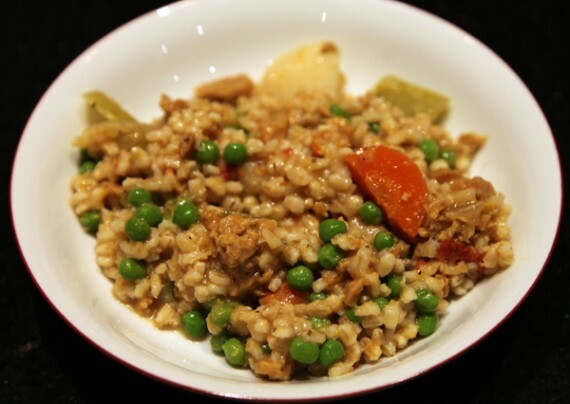 this dish was packed with vegetables, extra creamy, and even had a little bit of spice to it. i really wish i could buy this stuff by the tub because it is that damn good. 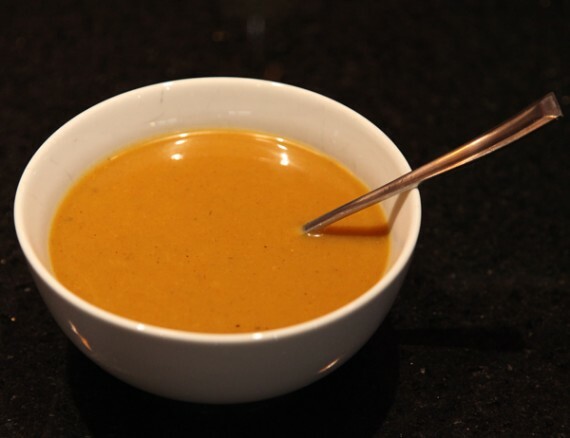 butternut squash soup: butternut squash, leeks, carrots, vegetable stock, nutmeg. the delivery also came with a bucket of butternut squash soup, which was pretty sweet and had a distinct flavor of nutmeg. it was pretty thick and filling, and there was a lot of it. the soup could make a couple meals on its own. 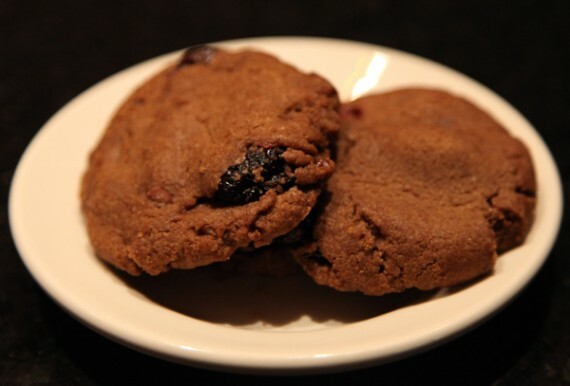 of course with all this amazing food, vegin’ out also provides dessert and this week it was 5 black forest cookies. super chocolatey and filled with dried cherries, these things were addictive. they were all gone within the first two days! i would highly recommend that every vegan in los angeles try vegin’ out home delivery for themselves, because i loved it! a single order (9-10 meals) is only $110…which is a great deal considering we have been eating it for dinner and lunch pretty regularly since monday and STILL have loads of it in the fridge. plus, this really is restaurant quality food and loads of it. the delivery bag was extremely heavy, and i couldn’t help but think what a fortune something of this weight would cost if it were from the whole foods prepared foods section. everything is super convenient to warm up, and each container comes with both stove top and microwave instructions. i’m really looking forward to my next order! if you want to get some awesome vegin’ out food for next week (on the menu is ziti bolognese, tempeh fried rice and poquito pie) be sure to hit them up before 5pm today. you won’t be sorry. oh and BTW, if you aren’t in LA, vegin’ out ships all the way to santa barbara and san diego. check out their site for details.